Question - Answers for "THE SOUND OF SILENCE". - Written by 'Paul Simon'. 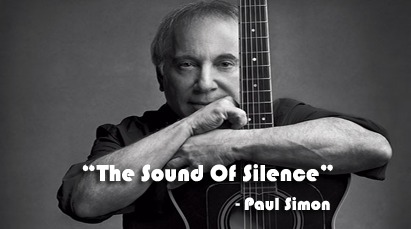 Paul Simon is not only a poet. He is a singer, songwriter, guitarist and an excellent pop lyricist. He has produced several albums and performed many solos under various pseudonyms ( नक्कली नाम ). Answer: In the first stanza the poet addresses to the darkness. He wants to talk with him because a vision has left seeds which are planted in his mind. Answer: The sound of silence is seemingly self-contradictory statement. It has very deep philosophical ( दार्शनिक ) tone. When man is in meditative state, he will attain the kingdom of complete silence. In such a silence some kind of revelation takes place, that in fact is the sound of silence. Answer: The neon light stands for the idol of the spiritually misled people which is worshipped by modern people. The poet's eyes were hurt by the flash of the neon light. Answer: In line 3, 4 and 5 of stanza 3, the poet explains that the people were " talking without speaking ", " hearing without listening", and " writing songs without any voice". The poet says that the people lack spiritual wisdom. With the lack of spiritual wisdom, everything loses its essence and becomes less important. Answer: The silence is a good thing. In complete silence, mind becomes tranquil and there will be no disturbance of any kind. It is the most elevated ( उच्च, श्रेष्ठ ) state of mind. Question Answers Of "The Sound Of Silence"
Complete Solution Of "The Sound Of Silence"
0 Response to "The Sound Of Silence | Questions And Answers"